We went bearish on the SPY yesterday morning, and offered up a set of corresponding ideas in the options chain. We signaled our interest in the SPY 10/08 $288.50-$287.50 Puts which just had the one session before expiration. It turned out to be a great rapid-strike play for anyone who cared to take advantage. Every single contract in our designated group produced legitimately impressive multi-bag intraday gain opportunities. 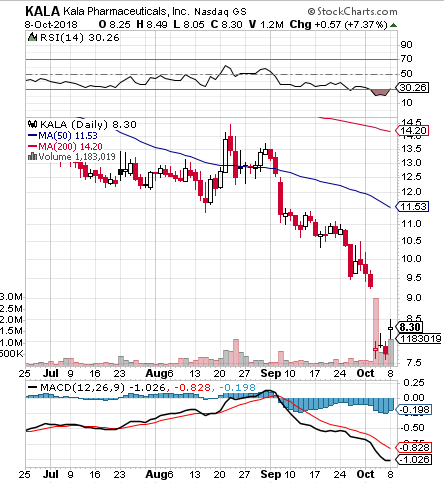 Catching our eye as a potential bottom bounce play this morning is KALA, which is presently exhibiting all of the bottom play indicators we typically look for. The RSI is in indicating that the stock is oversold, but with strength rising, and the MACD is sharply converging toward an impending cross. Meanwhile the PPS showed its first inclination yesterday of attempting to fill in the topside gap we can also plainly see on the snapshot below. We’re going yto place the stock on watch for a continued rebound, and also tag the KALA 01/18 $10 & 12.50 Calls for observation in the days and weeks ahead. 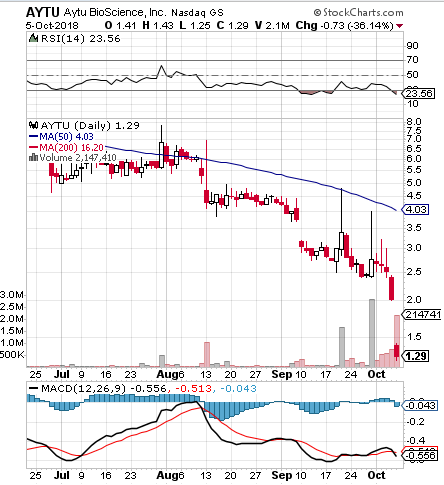 We placed CRMD on watch beginning on last Monday, October 1st, and subsequent to that report, would observe a low of 1.06 in the stock. Yesterday, CRMD attained a new high of 1.65, marking a notable 56% upswing in just a weeks time.